The summer of 2018 was a phenomenal season for women’s sport. Over 50,000 people – a record-breaking attendance for a ladies Gaelic football final – arrived at Croke Park to watch Dublin’s ladies Gaelic football team win their second All-Ireland title in a row. Cork continued to dominate at both senior and intermediate levels and coverage of the sport continued to increase. Internationally, Ireland’s underage female athletes won five medals at European and world level. However, the most obvious success story was that of the Irish women’s hockey team. Last August, Graham Shaw’s side captured the nation’s attention by claiming second place at the World Cup. Names such as Ayeisha McFerron, Katie Mullan and Nikki Evans played their way into the sporting history books and young players across the country gained new heroes. 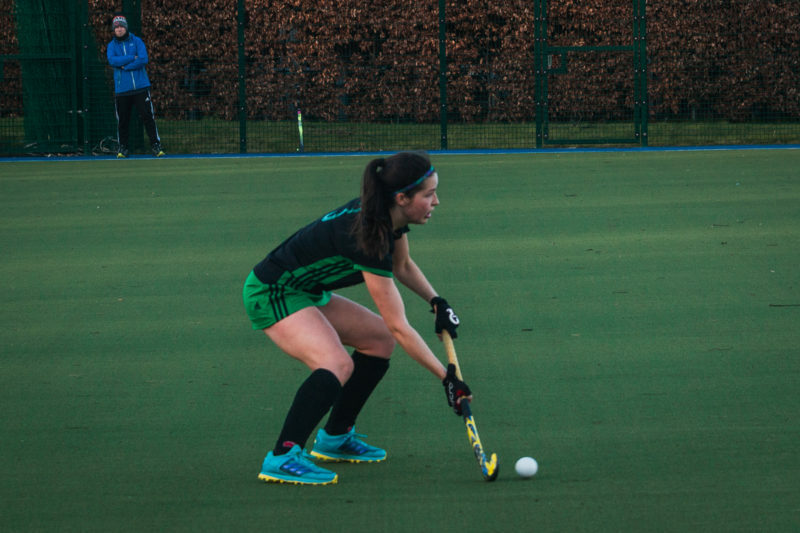 This new attention isn’t something that has escaped the attention of Issy Delamer, a second-year science student and a key figure for a Dublin University Ladies Hockey Club (DULHC) side who last week lifted the Leinster Division 1 trophy after an unbeaten campaign. Delamer has often been the rock at the heart of Trinity’s defence this season, and it shows in the statistics: they have conceded fewer goals than any other side in both leagues they compete in. DULHC are also in the hunt for immediate re-promotion to the EYHL, the top tier of Irish hockey. It’s been an exciting season, then. Her love for the sport grew when she entered secondary school as she lined out for Alexandra College, a school well known for a cohort of hockey alumni that included World Cup runner-up Nikki Daly. Delamer was part of the squad that, in her fifth year, won the Leinster League and Cup – a feat the school hadn’t achieved in a few years. “That was a big deal”, she explains. Following on from this success, the team went to the All-Ireland – held that year in Limerick. While they only came third or fourth (Delamer can’t remember exactly which) she says that “it was still really good fun” and a great learning experience. When the time came for Delamer to look at life after school, Trinity was not at the forefront of her mind. However, through open trials and meeting other girls who studied in Trinity, she was able to get an insight into what the College was like as a site where she could both earn a degree and continue her sporting development. In October, Delamer was announced as one of the College’s 68 sports scholars for 2018/19, alongside her teammates Rachel Burns and Erica Markey. She admits that the award “does spur you on to do extra”. Speaking about the benefit of the scholarship, she says that brings “a lot of small things you wouldn’t think of but that can really benefit you”. For Delamer, though, all this heady talk of international hockey doesn’t distract from her main focus: Trinity hockey. Delamer says the side’s main goal is their promotion bid. She and her teammates are seeking to consign to memory the ignominy of last season’s relegation, and secure an immediate return to the league in which they feel they belong. Delamer is cognisant of the need to balance studies and sport. She admits it can be difficult to balance her coursework with the demands of high-level hockey, and points to the introduction of Christmas exams as an added pressure. Competing in two leagues – as well as the extensive travel-time involved in away games – means it’s hard to fit everything in. But the focus, ultimately, is on the upcoming finals weekend. Trinity have secured a spot at the weekend that will decide who secures EYHL promotion, during which they’ll take on Queen’s, Monkstown and Catholic Institute. And if the season so far is anything to go by, Delamer, ever-reliable in defence and composed in possession, has a vital role to play in what promises to be an exciting climax to the year.